Ten’s in numerology represent completion, end of cycle and renewal. The ten of wands in a reading can indicate that you are nearing the end of a project that required an extensive amount of work. So much that the task at hand was burdensome and required way more work than originally expected. However, hang in there because with the ten of wands you are seeing the light at the end of the tunnel. When your project is completed, you will be renewed and free to start a new project. During this time, it is very important to appreciate your accomplishments verses focusing on your burdens. When the ten of wands appears reversed, it can indicate exhaustion in regards to a project with no end insight. It can also indicate that help is on the way and that your burdens will be eventually eased. Nine of Wands – One Last Battle – Almost Done! Nine’s in numerology indicates fruition, fruit of your labor, fulfilment and attainment and nearing completion. When the nine of wands appears in a reading, be prepared for one last battle regarding your relationships, personal endeavors, work career, projects, etc. The nine of wands indicates that the individual has been working extremely hard to accomplish their goals in spite of being met with all types of obstacles. As a result, the individual may feel completely burned out and feel that the end of their quest is far off when it is really quite near. They will need to muster up some additional strength to get past that last battle as they are nearing the completion of their goals. When the nine of wands appears reversed in a reading, it can indicate that the individual was not able to muster the strength needed to fight that last battle because they were overwhelmed by the obstacles. The nine of wands reversed could also signal the individual attempting a different approach then they had originally intended to complete the task at hand. Eight of Wands – Rapid Movement! Eight’s in numerology can indicate movement, manifesting wealth, action, change, abundance and prosperity, regeneration, accomplishment and attainment. When the eight of wands appears in a reading, it would be wise to be prepared because whatever the situation is, it will happen very rapidly! 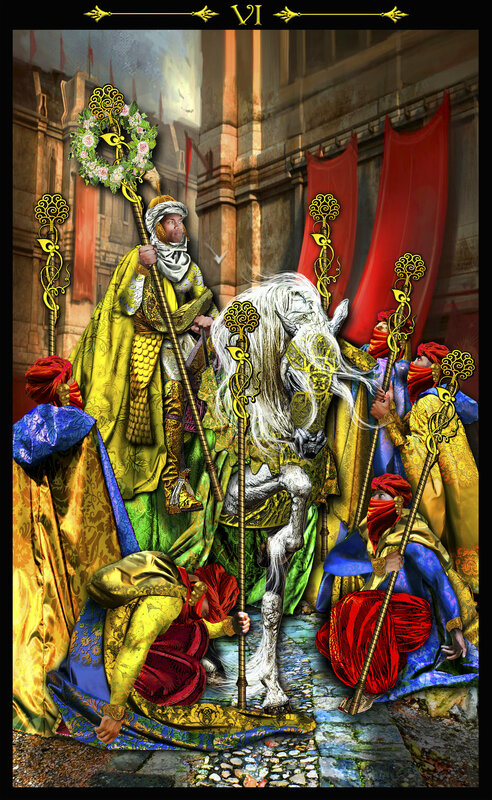 The eight of wands signals that you have been successful in standing your ground during the seven of wands phase. You can now continue with your projects, planning and activities which will move rapidly with a high level of intensity. When the eight of wands appears reversed it can warn of the potential for burn out as there are so many projects moving at such a rapid pace. In addition, it can indicate delays due to problems within projects that must be sorted out before the projects can continue. Seven of Wands – Standing Your Ground! Seven’s in numerology can indicate, reflection, introspection, assessment, spirituality, discovery and knowledge to name a few attributes. 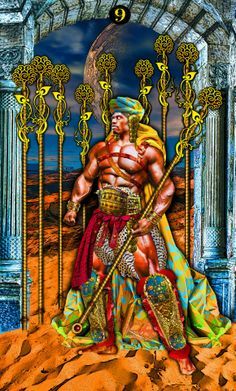 When the seven of wands appears in a reading , you are in for battles as there are people who want the victory and success you achieved during the six of wands phase. In order to maintain your position you must find the continuous strength needed to fight and stand your ground no matter what the issues may be e.g, personal, business, career. When the Seven of wand appears in a reading reversed, it can indicate that the individual may not have the strength needed to defend their position and stand their ground. He feels powerless and on the edge of losing the battle to hold on to what is dear to him. Six of Wands – Victory! The number six in numerology indicates, harmony, cooperation, problem solving and adjustment. The number six in any reading indicates that victory is sure to follow. The six of wands indicates that after the competition conflict experienced during the five of wands phase, victory has prevailed. As a result the victor is now experiencing public recognition in honor of their success. However, it is important to note that the victor was victorious not because he possessed the best skills, but because he had confidence in himself and was able to use his confidence to manuever through the conflict. The six of wands is a nice card to see in a reading because it signals that problems will be resolved easily. Five of Wands – Competition Conflict! Competition Conflict! Five’s are synonymous with conflict, courage, daring, strife, uncertainty, fear and upheaval. The five of wands like all five’s in the tarot signify conflict and change. However, unlike the five of Swords, the conflict represented in the five of wands is on a lighter note. 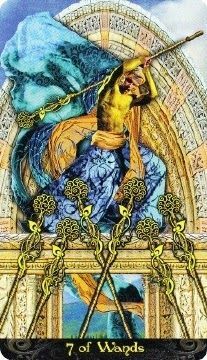 The five of wands signifies loss or indicates some type of difficulties usually in the realm of competition or some form of disruption which can either be positive or negative. 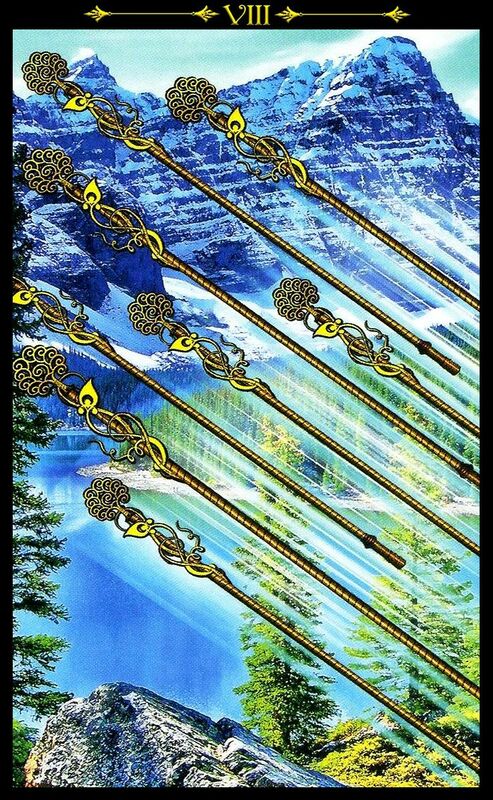 When five of wands appears in a reading, it can indicate that you may be stuck in a period of stagnation. 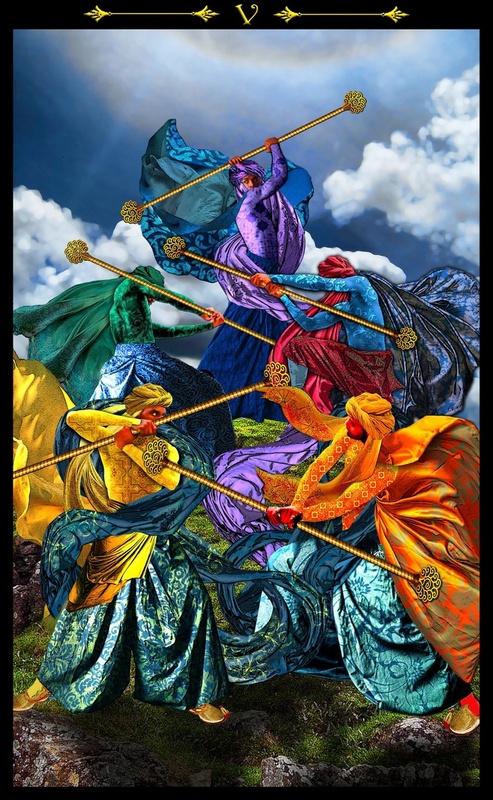 The conflict presented by the 5 of wands might be just what is needed to help you free yourself from your stagnated state. The five of wands can also indicate friendly competition from other people who oppose you but don’t really want to see you harmed. These people want to see how you merit against them in competition. When the five of wands appears reversed, it’s tone is negative filled with conflict and nasty competition designed to do harm vs. friendly competition. Four of Wands – Harvest! It’s Harvest Time! The number 4 in numerology can indicate strength, stability, material completion and manifestation. The four of wands indicates that the fruits of one’s labor are finally coming to fruition due to the planning and hard work accomplished during the Ace, Two and Three of wands phases. Overall, when the four of wands appears in a reading, it indicates that your plans, projects or goals are coming to fruition. This is a wonderful time of harvest enjoyed and shared with friends as well as people who have helped contribute to your success. 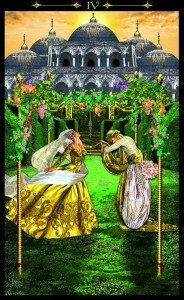 When the four of wands appears reversed in a reading, it indicates that the accomplishments are not being appreciated. During this time, it is important to be appreciative of your accomplishments. You’ve worked hard! !